Welcome to the third day of Teasers for My Favorite Things! This week is full of inspiration for you AND we have some fun prizes for you too, so be sure to hop on over to the MFT Blog to see how you can win some MFT goodies! All of these new products will be available for purchase on August 6th @ 10 PM Eastern. 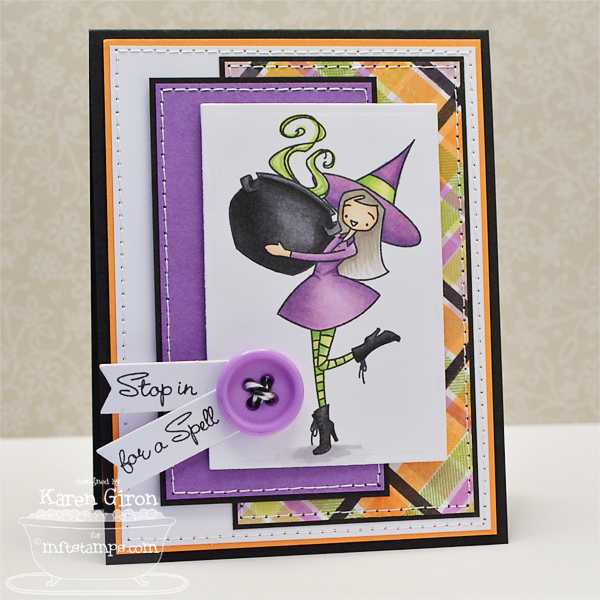 Today I'm showing off this super cute new à la modes Bewitching stamp set. I stamped her in Memento Tuxedo Black ink on X-Press It Blending Card Stock and then colored her with Copic markers. I didn't use any patterned paper on this one, but reached for the new Plaid Builder Background stamp set, which is out of this world fantastic!! I used several inks to create the background - Black Licorice, Orange Fizz, Jellybean Green, Sour Apple, Grape Jelly and Grapesicle. I stamped the sentiment on a Sentiment Strips Die-namics (which is cut in half) and then tucked it under a Grape Jelly Button. The layout is Freshly Made Sketches FMS95. I used the Plaid Builder Background stamp again on the inside of my card in Sour Apple Ink and then stamped the sentiment right over the top in Black Licorice. Here are the MFT products I used today - all of the new products will be available for purchase on August 6th at 10 PM Eastern. Your card is adorable! I'm amazed by the plaid. I would have sworn the plaid was patterned paper... clever! Love love love the plaid. I see I'm going to have to get some of the grape jelly paper. Love the color. So cute and I adore the plaid background, fabulous. She's adorable and that plaid is glorious! Totally totally fab! this card is super cute. love the colors of the plaid!!! Love your card! That plaid background builder is a must have - you did an amazing job with it and I love the colors you chose! Love the colours and the plaid just makes it all perfect! 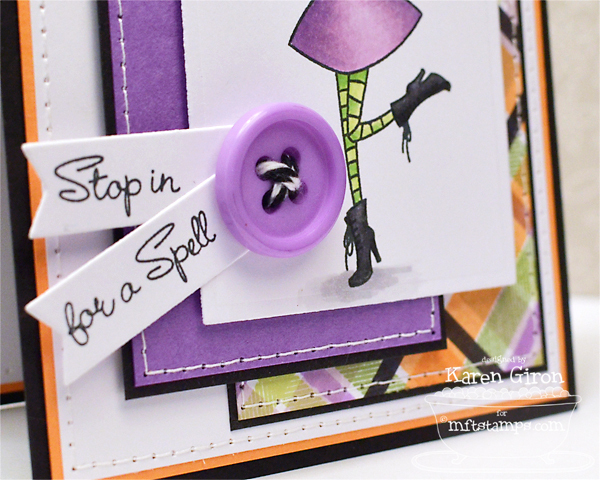 Really cute bewitching card! The way you used the plaid builder is fantastic. That Halloween plaid is amazing! Great work! So cute...love the plaid and your colors! ohmygoshohmygosh!!! your plaid is sooooo dreamy! cute card, karen. OMGee! This is such an adorable card! Love it! Fantastic card. Great colouring of the bewitched stamp. Love those sentiments - too cute!! Cute card, I just love how you use layers on your cards! A wonderful card Karen! love the button with the banner sentiments! Purple is my favorite! Love your coloring. best witchy ever. So love this!! The colours are fantastic!! Love your Plaid stamping and stitching on this card. Superb! Love your card and her! Wow! Cute card and you ROCKED that background stamp. Super cute card! Love that new ala mode! Beautiful card, your stitching is so perfect!! Don't you just love Halloween colors! I love your card! That plaid background is so pretty! Wow, what a beautiful card. I had to look twice when I read that you used the plaid background stamps - gotta have them! 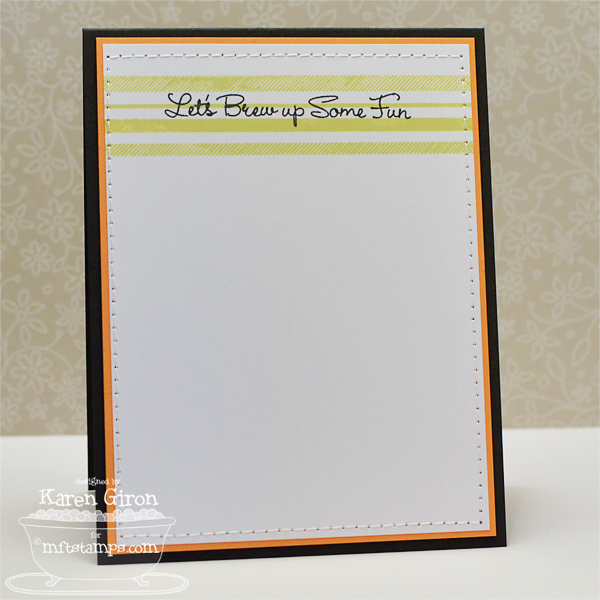 fun card and love the color choices. darling image and love the plaid background. Wow Karen! Great layers! Great stitching and great plaid! I guess everyone's going to be able to tell I love the new plaid bg stamps! So stinkin' cute. Can't wait for fall. Love the plaid. Your card is awesome.